There could be a new ninth planet floating beyond the dark edges of our solar system, according to new research published in The Astronomical Journal from CalTech professors Mike Brown and Konstantin Batygin. If those names ring a bell, it’s because Brown and Batygin worked to reclassify Pluto as a dwarf planet in 2006. The scientists behind that decision reasoned that Pluto was one of many small icy objects beyond the orbit of Neptune in an area known as the Kuiper belt. Most objects in that part of our solar system don’t meet the basic requirements for being a planet such as being spherical in shape, orbiting the sun, and clearing its own orbit of debris. But now Brown and Batygin think they’ve found a celestial body that would meet all of the requirements for being classified as a planet. The researchers studied six small objects in the Kuiper belt and noticed their orbits funneled toward the sun in a very specific formation. The likelihood of this being a coincidence is slim to none. 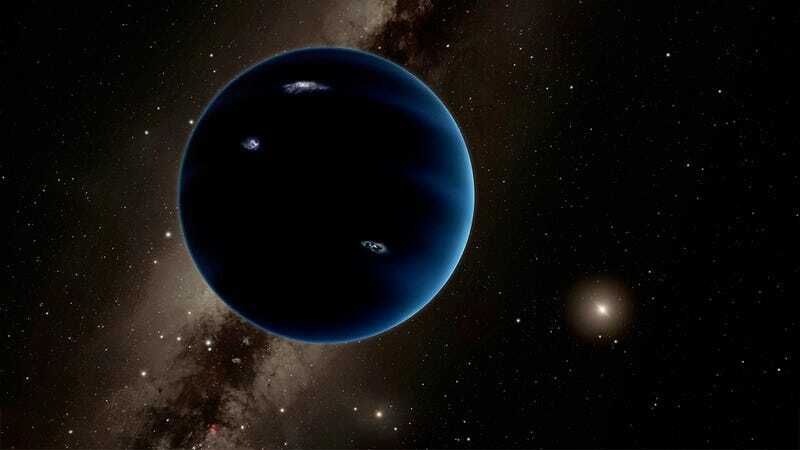 What researchers believe is that a new planet, unofficially dubbed “Planet X,” is pulling these objects into its orbit. The theory is fairly radical. If true, it means that Planet X would be orbiting the Sun from a distance astronomers have never seen before. The celestial body is so far away, it takes 15,000 years for it to make one trip around the Sun. By comparison, Neptune, which has the longest known orbit around the sun, takes 164 years to complete. The existence of Planet X is entirely inferred by the movement of a half-dozen Kuiper belt objects. That doesn’t necessarily mean the prediction is wrong, though. This isn’t the first time astronomers have inferred the existence of another planet by calculating the movement of other objects in our solar system. When Neptune was discovered in 1846, it was because astronomers noticed that Uranus was being pulled out of normal orbit. Scientists had predicted that the irregular orbit was because of the gravity from another planet decades earlier. This could very well be another case of history repeating itself. Top image: Planet Nine—Artist’s Representation (Caltech/R. Hurt (IPAC)).